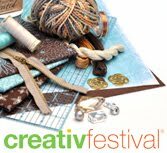 On Monday, I will be confirming my presence at the Creativ Festival in October 2010 on October 22, 23, & 24th. I am teaching several courses that are part of the Creativ Festival that are exclusive just to the show. Registration for these courses are done through the show coordinators itself. The courses will be a mix of looming and crochet based projects where we will go through hands on experience. Ask all the questions you need and work through entire projects with me personally. I am teaching 3 times per day at the free fibre arts area with an assortment of projects for 1/2 Hour Increments for up to 25 people at one time. First come first serve. Schedules will be confirmed closer to the show dates. Not enough MIKEY for ya… Diva Dan and I will appear on centre stage 3 times within the duration of the show for 1/2 Hour. You can come see us LIVE do a live broadcast right for the show. We are scheduling to broadcast live during the entire length of the show. This is also an opportunity to finally meet Diva Dan and In Person! Still not enough… We have viewers who are interested in helping us out… We only need about 3 viewers… we have one definitely confirmed to be there during the entire show with us. You will meet Veronica from Wisconsin. We will need one of the viewers to be left handed and that will tag team Michael during the entire show to give the left handed version of crochet. This person, along with Michael could be teaching upwards to 600 people to crochet during the entire show, not to forget all the demonstrations and stuff at our display place. We are bringing our PINK PURPLE and SILVER Christmas TO LIFE at the Creativ Festival. We are looking for help showcasing WINTER, BABY, AFGHANS, LAPGHANS, DECORATIONS, DOGGY COATS, SAMPLES of STITCHES. We have a 10 by 10 dedicated Booth. We are looking to fill it up with EXAMPLES from Mikey and VIEWERS! We are looking for theming colours to compliment our booth! At the end of the show, if you have sent me something for display, we will donate it to children’s charities! You should know, there is a tentative plan to be part of the RUNWAY FASHION SHOW showing off our HUNNIE POT HATS! The purpose of the HUNNIE POT HATS are to give hats to children in hospital across Canada! For anyone wishing to make a HUNNIE POT HAT and send it in… you are strengthening the campaign of giving children comfort in hospitals across our nation. There are costs associated with us being at the show. We have managed to get “some” sponsorship which includes a large donation from ROYAL APPLIANCES who are lending us a 42″ Flat Screen TV for our display for our videos to constantly run throughout the show! Sponsorship also includes our clothing, costs of materials to demonstrate with, our stay in Toronto, and more. We are planning a sponsorship drive… We are planning on wearing very flamboyant vests, large financial contributors of over $500 they will have their logos embroidered on our vests which we will wear throughout the show which include all the back areas in all the classes that the show is putting on that is not open to the general public for free. Also, these same people will have a logo spot within the 80,000 publications which go around the world for sponsoring the Creativ Festival. Also, for anyone sponsoring under $500 – $250 range, we will place your name up at our display as being a contributor to our show. You may provide literature for people to take. This show has 40,000 people attend. We’ve been told to provide enough material for 5,000 people. We have a plan in motion for a full colour post card with a free pattern on the back of the postcard for people to take! Our goal is NOT TO SELL CROCHET ITEMS… but merely teach people to reach within themselves to pull their childish creativity back out. We will have DVD’s of tutorials to sell at the show to also cover some of our costs associated with this. As we get closer to the show, we will have some tickets to give away for the show! Also, we have been told that we have two tickets for two people to attend one of the backstage areas of one of the courses I am teaching! We will be putting together our theming and what we are looking for… and we are OPEN TO IDEAS from Viewers on what can be displayed and HOW to display it! This entry was posted in Announcements and tagged Creativ Festival, DECORATIONS, Diva Dan, Michael. Bookmark the permalink.